Community-Based Research; Participatory Action Research; Urban Renewal and Community Building; Immigrant Political Activism, Immigration Policy; Cross-racial and Cross-national Organizing. 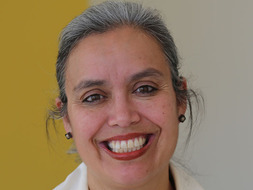 Dr. Alexandra Piñeros-Shields has organized to advance the human and civil rights of immigrants for the past 30 years with, among others, the Massachusetts Immigrant and Advocacy Coalition, the International Irish Immigrant Center, Centro Presente, Catholic Charities Immigration and Refugee Services, and the Central American Refugee Center. Overcoming racial and national divides between immigrant communities, she has organized immigrants to challenge repressive immigration policies and economic inequality. She has designed popular education curriculum and developed democratic governance models that promote collaborative decision-making to create mechanisms for immigrants to affect the decisions that shape their lives. Serving on Governor Patrick’s design team for the New Americans Agenda, she organized immigrant communities to advocate for themselves through public hearings and produced an immigrant integration policy agenda for Massachusetts. Dr. Piñeros-Shields received her PhD from the Heller School at Brandeis University. She wrote her dissertation about immigrant organizing across race and nationality. She has lived and taught in the Soviet Union and in China. Hughes, D., Curnan, S.; & Piñeros Shields, A.. Unitarian Universalist Association Leap of Faith Pilot Logic Model Report. Center for Youth and Communities, Brandeis University, Waltham. MA 2011. Hughes, D., Moldow, E.,Lanspery, S., J.F. Morgan Associates, & Piñeros Shields, A.. Building Neighborhood Capacities to Support Youth and Families in Good Neighborhoods and Good Schools Initiative. Center for Youth and Communities, Brandeis University, Waltham. MA Report to the Skillman Foundation: 2011. Pineros-Shields, A., Moldow, E., & Hughes, D. Teen Futures Year 2 - Report to the Hyams Foundation. Center for Youth and Communities, Brandeis University, Waltham. MA: 2011. Pineros-Shields, A., Moldow, E.; Hughes, D., & Khera, G.. Teen Futures Year 1 Report to the Hyams Foundation. Center for Youth and Communities, Brandeis University, Waltham. MA 2010.